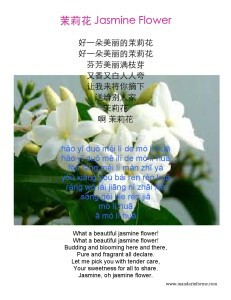 茉莉花 is a very well-known folk song from China. The song dates to 18th century. It is possibly the most popular Chinese folk songs widely known outside China. This is a great song to teach beginning Chinese learners. The lyrics are simple and the tune can be easily hummed to. Listen to 2 different versions of song. 茉莉花 This version is by 黑鸭子, a singing group of 3 women. 茉莉花 This is the tradition version. This is a video of my students singing and fan dancing 茉莉花 while I am playing the piano. Thank you so much for the kind compliment. Hope you enjoy my website and find it useful. Have a great day.